Illustrations note 210 Illustrations, black and white; XIII, 437 p. 210 illus. This textbook is designed for a one or two semester graduate course on Riemannian geometry for students who are familiar with topological and differentiable manifolds. 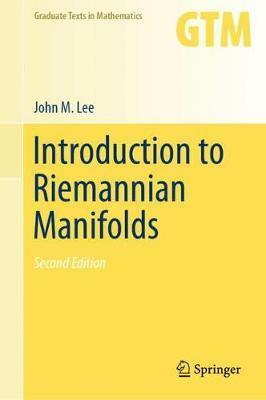 The second edition has been adapted, expanded, and aptly retitled from Lee's earlier book, Riemannian Manifolds: An Introduction to Curvature. Numerous exercises and problem sets provide the student with opportunities to practice and develop skills; appendices contain a brief review of essential background material. While demonstrating the uses of most of the main technical tools needed for a careful study of Riemannian manifolds, this text focuses on ensuring that the student develops an intimate acquaintance with the geometric meaning of curvature. The reasonably broad coverage begins with a treatment of indispensable tools for working with Riemannian metrics such as connections and geodesics. Several topics have been added, including an expanded treatment of pseudo-Riemannian metrics, a more detailed treatment of homogeneous spaces and invariant metrics, a completely revamped treatment of comparison theory based on Riccati equations, and a handful of new local-to-global theorems, to name just a few highlights. Preface.- 1. What Is Curvature?.- 2. Riemannian Metrics.- 3. Model Riemannian Manifolds.- 4. Connections.- 5. The Levi-Cevita Connection.- 6. Geodesics and Distance.- 7. Curvature.- 8. Riemannian Submanifolds.- 9. The Gauss-Bonnet Theorem.- 10. Jacobi Fields.- 11. Comparison Theory.- 12. Curvature and Topology.- Appendix A: Review of Smooth Manifolds.- Appendix B: Review of Tensors.- Appendix C: Review of Lie Groups.- References.- Notation Index.- Subject Index. John "Jack" M. Lee is a professor of mathematics at the University of Washington. Professor Lee is the author of three highly acclaimed Springer graduate textbooks : Introduction to Smooth Manifolds, (GTM 218) Introduction to Topological Manifolds (GTM 202), and Riemannian Manifolds (GTM 176). Lee's research interests include differential geometry, the Yamabe problem, existence of Einstein metrics, the constraint equations in general relativity, geometry and analysis on CR manifolds.